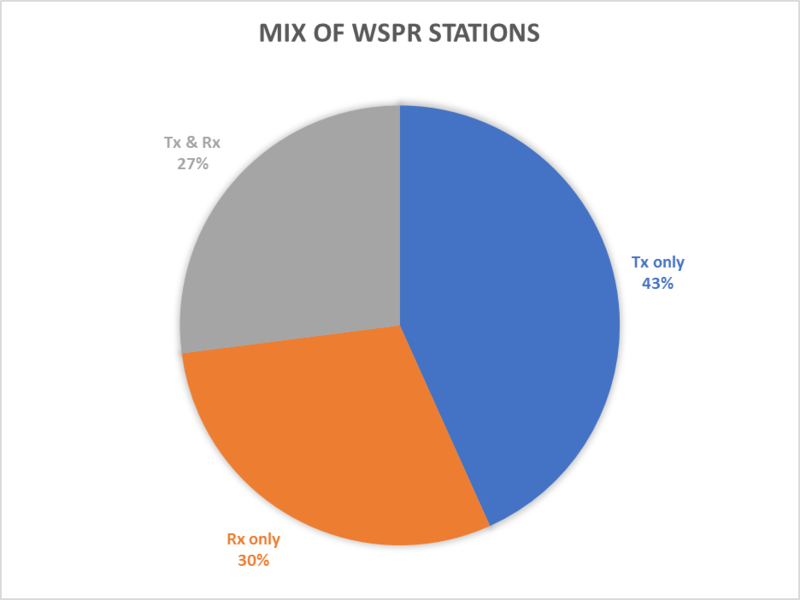 Above is a pie chart of the mix of Tx Only, Rx ONLY and Tx/Rx stations. The largest group is Tx Only, 44% of stations do not contribute reception records. Nextly, 30% are Rx Only, and 27% Tx and Rx. If you were to divide the 200Hz segment into nominal 6Hz channels, you would have 33 channels, with 30 time slots per hour or 720 slots per day, we can calculate that the raw capacity is for 720*33=23760 transmissions per day without collision / interference. Mitigating against severe congestion is that stations are unlikely to be heard over a wide area due to propagation conditions and of course many have very low EIRP for various reasons. The tendency for stations to congregate around the centre of the segment exacerbates congestion overall, but of course helps ‘smarter’ operation closer to the segment edges. A good indication of the existence of congestion is that one station in the UK recorded 33 spots in many 2min intervals over that day, and some other UK and European stations were up in that region.